Vanuatuans live in one of the world’s most diverse linguistic environments: WHL Travel, CC BY-NCThe 2015 Paris Climate Conference (COP21) is in full gear and climate change is again on everyone’s mind. It conjures up images of melting glaciers, rising sea levels, droughts, flooding, threatened habitats, endangered species, and displaced people. We know it threatens biodiversity, but what about linguistic diversity? Humans are the only species on the planet whose communication system exhibits enormous diversity. And linguistic diversity is crucial for understanding our capacity for language. An increase in climate-change related natural disasters may affect linguistic diversity. A good example is Vanuatu, an island state in the Pacific, with quite a dramatic recent rise in sea levels. There are over 7,000 languages spoken in the world today. These languages exhibit enormous diversity, from the number of distinctive sounds (there are languages with as few as 11 different sounds and as many as 118) to the vast range of possible word orders, structures and concepts that languages use to convey meaning. Every absolute that linguists have posited has been challenged, and linguists are busy debating if there is anything at all that is common to all languages in the world or anything at all that does not exist in the languages of the world. Sign languages show us that languages do not even need to be spoken. This diversity is evidence of the enormous flexibility and plasticity of the human brain and its capacity for communication. Studying diverse languages gives us invaluable insights into human cognition. But language diversity is at risk. Languages are dying every year. Often a language’s death is recorded when the last known speaker dies, and about 35% of languages in the world are currently losing speakers or are more seriously endangered. Most of these have never been recorded and so would be lost forever. Linguists estimate that about 50% of the languages spoken today will disappear in the next 100 years. Some even argue that up to 90% of today’s languages will have disappeared by 2115. There are many reasons why languages die. The reasons are often political, economic or cultural in nature. Speakers of a minority language may, for example, decide that it is better for their children’s future to teach them a language that is tied to economic success. For example, the vast majority of second-generation immigrants to the United States do not speak their parents' languages fluently. It is economically and culturally more beneficial to speak English. Migration also plays a large role in language change and language death. When speakers of Proto-Indo-European migrated to most of Europe and large parts of Asia between 6,000 and 8,000 years ago, they probably brought about massive language change and language death. In Western Europe, Basque could possibly be the only modern language that survived the influx of the Indo-Europeans. In the coming centuries, we may experience an increase in climate-related migration. It is already clear that climate change influences modern migration patterns. Climate-related disasters displaced an estimated 20m people in 2008. The areas affected by climate-related disasters are often ones that exhibit great linguistic diversity and include languages with small numbers of speakers, which are especially vulnerable. The threat facing islanders in Vanuatu is not just due to rising sea levels. Recent tectonic movements have also caused parts of some islands to sink. As a result, a whole coastal village had to be relocated further inland from 2002 to 2004. This prompted a 2005 United Nations Environment Programme press release to call these villagers the world’s first climate change refugees. These climate change refugees happen to be living in a country that has one of the highest levels of linguistic diversity in the world. Vanuatu is the third most linguistically diverse country in the world, as measured by the Greenberg index. The index shows the likelihood that two randomly selected speakers in a country have different native languages. Vanuatu’s Greenberg index is a staggering 97.3%. Vanuatu has 110 indigenous languages spoken in an area of about 15,000 square kilometres (about 6,000 square miles) – that’s about one language for every 136 square kilometres. 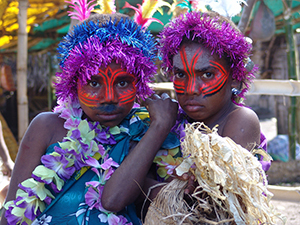 Half of the languages spoken on Vanuatu have 700 speakers or less. Some of the countries affected by the earthquake and tsunami that killed about 230,000 people in 2004 are also very linguistically diverse. India has 447 indigenous languages and a Greenberg diversity index of 91.4% and Indonesia has 706 indigenous languages and a Greenberg diversity index of 81.6%. Researchers had just discovered the Dusner language, which had only a handful of remaining speakers, when flooding in 2010 devastated the Papua region of Indonesia, where the Dusner village is located. Luckily, some of the speakers had survived, and the language could be documented. Often, we do not know precisely what effect natural disasters have on the languages spoken in affected areas. What we do know though is that environmental pressures increase mobility and migration and that migration affects language change and death. A further increase in climate-related disasters may further accelerate the disappearance of languages. This would be a tragic loss not just for the people and cultures involved, but for cognitive science as well.